MONDAY, Oct. 24, 2016 (HealthDay News) -- Just one season of competitive football may cause changes in some young players' developing brains, even if they don't get a concussion during play, a small study found. Using imaging scans, researchers spotted "microstructural" changes in the white brain matter of 25 male athletes aged 8 to 13 after a season of football. They also found that players experienced more significant brain changes if they took a greater number of hits and stronger hits to the head, said lead researcher Dr. Christopher Whitlow. He's chief of neuroradiology at Wake Forest School of Medicine in Winston-Salem, N.C.
"We're seeing some associations between the amount of change in the brain and the amount of exposure to head impacts," Whitlow said. "The more exposure they've had, the more change you see." However, Whitlow was quick to add that these changes are imperceptible to the naked eye, and future research might prove these changes harmless. "Football is a very physical sport, so there are lots of changes in the body after a season of football," he said. "Players have cuts and bruises, and after the season these go away. Perhaps the change we're seeing is just another one of those physical manifestations of playing a season of football that will just go away." 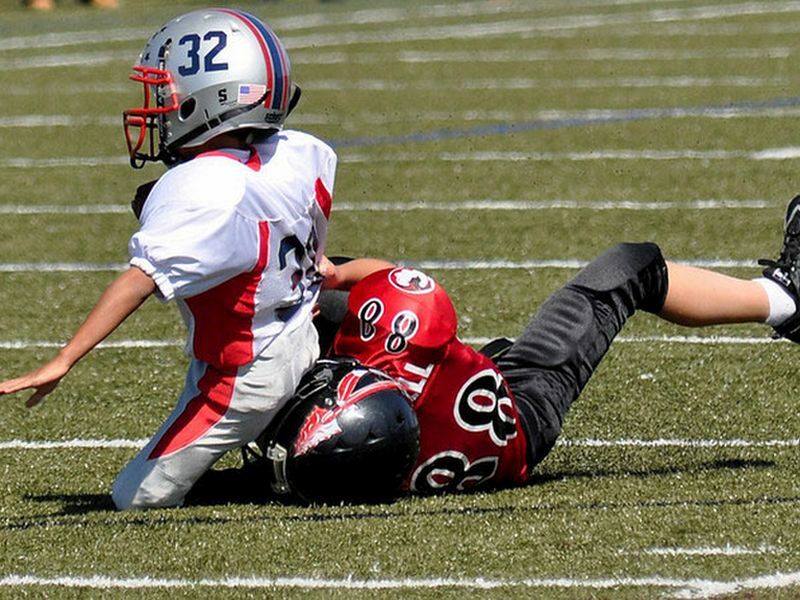 Nearly 3 million youth players participate in tackle football programs across the United States. And there are about 2,000 active National Football League players, Whitlow noted. Whitlow said he and his colleagues were particularly concerned about the impacts to the head that don't lead to a concussion. The brains of youth and high school football players are still undergoing rapid development, and repeated hits that don't result in brain injury still might have an effect that adds up over time, the researchers said. To study this, the research team recruited 25 participants from a local youth football team during the 2012 and 2013 seasons. At the beginning of the season, players had an advanced MRI scan performed on their brain. They also were provided helmets embedded with sensors that measure the severity of every hit to the head that occurs during play. "We're evaluating the biomechanics of each one of those head impacts, for every practice and every game," Whitlow said. He added that the researchers reviewed video recordings to verify that the sensors had accurately recorded each hit. None of the players in the study suffered a concussion during the season of play. At the end of the season, the players underwent a second MRI scan, and the researchers compared the two scans to track changes in the brain. The researchers also evaluated the head impact data for each player, to see if there was any connection between the hits they took and the changes observed in their brains. The researchers concluded that players with more exposure to head impacts displayed more changes to their white matter. The brain's white matter is composed of millions of nerve fibers that act like communication cables, connecting various regions of the brain. "We're seeing changes in the brain related to exposure, but if you talk to these players, if you look at their clinical imaging, there's nothing you can identify that's abnormal about them," Whitlow said. "So the question becomes, what do these changes mean? And that we don't have an answer to, yet." Dr. Christopher Giza is director of the Steve Tisch BrainSPORT Program and a professor of pediatric neurology and neurosurgery at the University of California, Los Angeles. He said the study results are consistent with previous studies, and the tools used by the researchers add valuable new data to the field of study. "A big strength of this study is they [the researchers] have this very quantitative measure that can essentially count the magnitude, the size and the number of impacts," Giza said. "That's certainly more objective than relying on an athlete or coach to tell you that somebody has symptoms. "There is some evidence that cumulative impacts, regardless of whether you had a concussion or not, might be a problem," he continued. "Being able to measure those impacts more objectively can be helpful." However, Giza noted that this study contained too few players to provide conclusive data. Also, a couple of players seemed to suffer more hits and underwent more brain changes than the rest, which might have skewed the results, he said. "I wouldn't want to make a conclusion about every kid playing football on the basis of 25 kids in this study, particularly if the results are driven by one or two individuals in this study," Giza said. Whitlow said the new results come from year two of a five-year study, and the researchers will continue to track some of these players. The researchers also conducted cognitive tests on the players, and are analyzing that data for future publication. "There are some additional questions we need to ask," he said. "What becomes of these changes? Do they linger? Do they go away? Do they have any long-term consequences?" The new study was published Oct. 24 in the journal Radiology.